Apple revolutionized the music industry and every one fell in love with their iPods, iPhones, iPads and so on. One overlooked feature of all these gadgets was their earbuds. Even those who were dead against using Apple products were exposed to the company’s iconic white earbuds (watching almost everyone else wear). The looks were iconic, but the earbuds had an uncomfortable fit and abysmal audio quality. This gave rise to an entire new industry catering to great looking and awesome sound earphones or headphones. The earbuds never fit my ears properly and they used to fall off at every possible occasion. Not to mention the pain in my ears while trying to ensure that they remain fit inside my ears. I stopped using them shortly after. 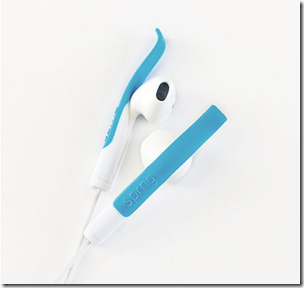 With iPhone 5, Apple announced the replacement of those dreaded earbuds with a new product called Earpods. I was excited as you can imagine. However, my excitement was short-lived as the Earpods fell off faster than the earbuds. The sounds quality was better but I could hardly enjoy it for a few minutes before one of the earpods fell down and then the other one too. Usually it used to be such that one of the earbuds falls off, I try to place it back again and while doing so – the other one falls off. Maybe I had extra special ears after all! I went on with my life using Beats Solo and Bose QuietComfort. Note that both these headphones are excellent but pricy. A few days earlier I found a smart solution and it costs only $10. The solution is Sprng. Don’t go by the price as it will easily be the best $10 spent, Fortune reporter Anne VanderMey says. 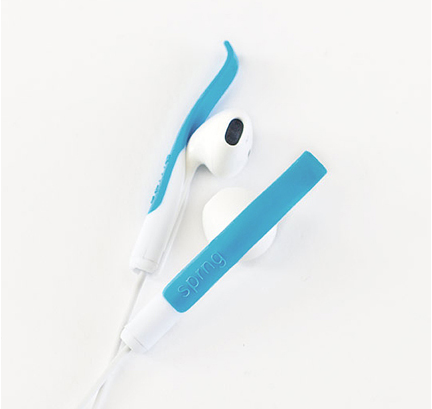 The Sprng is a spring-like accessory created by Ohm Industrial Design that clips to the stem of Apple’s EarPod earphones, which are included with every iPhone and iPod, to create an extra point of contact in the ear for people that have fit issues with Apple’s Earpods. Sprng is sold from Sprng website. Cost is only $10 including S&H in Canada and US. Here is how sprng works.